The naming of a street in the Lebanese capital Beirut after a late military commander of the Hezbollah movement has sparked a political row. Mustafa Badreddine, after whom the street in the suburb of Ghobeiry is named, is alleged to have masterminded the assassination of former Prime Minister Rafik Hariri in 2005. The street itself leads to Rafik Hariri University Hospital. Hariri's son Saad, the current prime minister, called the move "seditious". 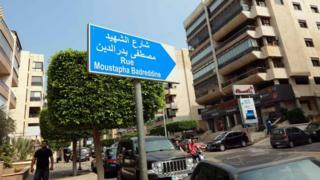 The street sign was changed just days after the UN-backed Special Tribunal for Lebanon (STL) began hearing the closing arguments in the trial in absentia of four other men linked to Hezbollah who are accused of being behind the car bombing that killed Rafik Hariri and 21 other people. Hezbollah has denied any involvement in the assassination. After attending the trial in The Hague last week, Saad Hariri said he was confident justice would prevail and that his father's murderers would be held to account. Image caption Saad Hariri said the decision to name a street after Badreddine was "regrettable"
But he also stressed he would behave as an "official who has the responsibility to protect the country and the Lebanese people" even if a group in the national unity government he has been trying to form since May's election was implicated. On Tuesday evening, the prime minister tweeted: "The decision to name a street after Mustafa Badreddine is regrettable. "There are people who want to drag the country to another place. They must take responsibility for this before God Almighty and before the Lebanese people. "We are talking about extinguishing sedition. But this is sedition itself." The interior ministry has said it has demanded the street signs be removed. But the municipality in Ghobeiry, where support for Hezbollah is strong among residents, has insisted the name change was "legal, normal and legitimate". It said it informed the ministry of the move in June 2017, and that the ministry did not express an objection within a month, as required by law. Badreddine - who was designated a terrorist by the United States - was killed in 2016 in Syria, where he was believed to have led Hezbollah units fighting in support of President Bashar al-Assad. He is also alleged to have been involved in the October 1983 bombing of the US Marine Corps and French army barracks in Beirut that killed 305 people, and the bombing of the US and French embassies in Kuwait in December 1983.